Stay with us and you will discover that luxury is affordable. Experiment a new concept of Guesthouse - more for less! If you are seeking for a little getaway, accommodation for your holiday or a business trip in a relaxing atmosphere with a touch of luxury, then the Lisbon Dreams Guesthouse is the right place to stay. Lisbon Dreams is located near the nineteenth century boulevard - Avenida de Liberdade - the main avenue of the city and the „bridge“between the downtown and the commercial center of Lisbon. Our guesthouse is easily accessible by public transportation (metro & bus) and we are in a walking distance from the famous neighborhoods of Baixa (downtown), Bairro Alto & Chiado (cultural and bohemian heart; nightlife and shopping) and Alfama (the historical soul of Lisbon). 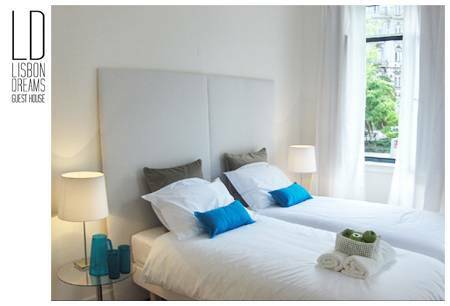 Our guesthouse has double, twin and triple rooms with sophisticated design of elegant simplicity. Each room hides a little cultural treasure, enabling you to discover a bit more of Lisbon. Our shared bathrooms, meant for individual use, are cleaned all day around. Our common rooms include fully equipped kitchen, TV lounge, dining area and two cozy patios that are the best places to have breakfast, catch some sun and daydream in the afternoon with a glass of Portuguese wine, bite of local appetizers and good company. Our staff is here to provide you inspiration and information that helps you to take the best out of your stay and enjoy the charming city of Lisbon to full extent. 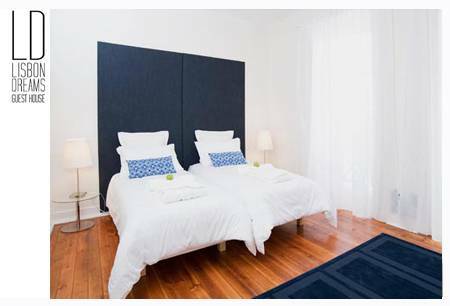 Lisbon Dream Guesthouse free features include: breakfast, coffee & tea, towels, bathrobe & bed linen, safety box, luggage storage, Internet & wireless access, maps & touristic info, travel library. 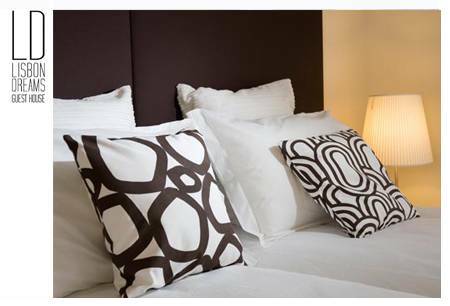 We also have available laundry service and the service of breakfast in bed. Breakfast included Children permitted Free features include: breakfast Internet & wireless access Internet access Internet wireless (free) Laundry/valet service Linen included No Smoking No curfew Safe deposit box Taxi service Tour/sightseeing assistance bathrobe & bed linen coffee & tea luggage storage maps & touristic info safety box towels travel library. 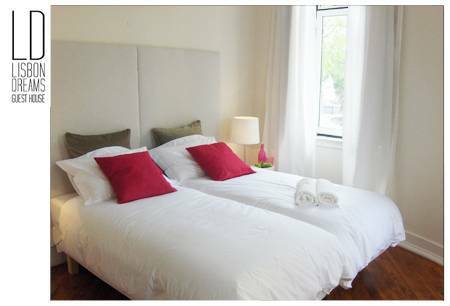 Our guesthouse has double, twin and triple rooms with sophisticated design of elegant simplicity. 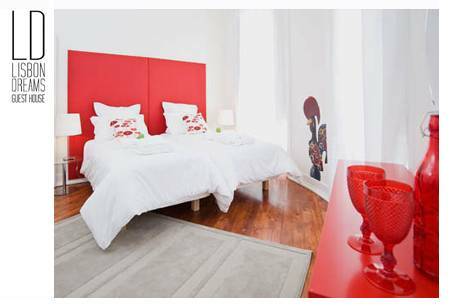 Each room hides a little cultural treasure, enabling you to discover a bit more of Lisbon. Our shared bathrooms, meant for individual use, are cleaned all day around. We provide you a towel, bathrobe and slippers. Guests can cancel their reservation free of charge up to 24h before arrival. In case the reservation is not cancelled 24h in advance, the first night will be charged on the credit card given. Our guesthouse is located near one of the most remarkable and historical squares of Lisbon – the Marquês de Pombal Square (Praça do Marques de Pompal) – and the city’s main avenue Avenida Liberdade. Our guesthouse is in the bright yellow building at the corner of two streets: Rua Rodrigo Fonseca, where the entrance is (door no. 29) and Rua Alexandre Herculano that goes up from the Avenida Liberdade. cross the roundabout, go one block down the Avenida Liberdade, then turn right on the first street that is Rua Alexandre Herculano, walk 3 blocks up the street and on the left side of the third crossing you will find the yellow building of our guesthouse. Taxi from the airport should be around 10€. Go from the main bus terminal downstairs to the Sete Rios Metro Station. Catch the blue line in the direction of Sta. Apolonia. 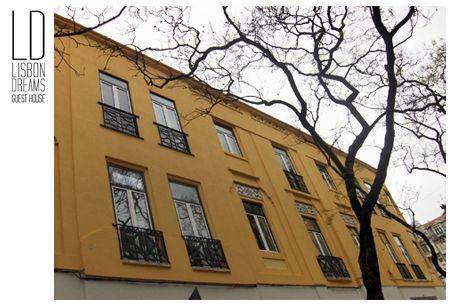 Go off at Marquês de Pombal Station and take the exit “Avenida Liberdade / Rua Alexandre Herculano” Walk 3 blocks up the street Rua Alexandre Herculano and on the left side of the third crossing you will find the yellow building of our guesthouse. Enter the Sta. Apolonia Metro Station and catch the blue line in the direction of Amadora Este. Go off at Marquês de Pombal Station and take the exit “Avenida Liberdade / Rua Alexandre Herculano” Walk 3 blocks up the street Rua Alexandre Herculano and on the left side of the third crossing you will find the yellow building of our guesthouse. Enter the Oriente Metro Station and take the red line till the last stop Alameda, then catch the green line in the direction Cais do Sodre and go off at Baixa Chiado. Now switch to the blue line in the direction Amadora Este and go off at Marquês de Pombal. Take the exit “Avenida Liberdade / Rua Alexandre Herculano”, walk 3 blocks up the street Rua Alexandre Herculano and on the left side of the third crossing you will find the yellow building of our guesthouse. Enter the Cais do Sodre Metro Station and take the green line in the direction Telheiras. Go off at Baixa Chiado and switch to the blue line in the direction Amadora Este and go off at Marquês de Pombal. Take the exit “Avenida Liberdade / Rua Alexandre Herculano”, walk 3 blocks up the street Rua Alexandre Herculano and on the left side of the third crossing you will find the yellow building of our guesthouse. Walk up the main avenue - Avenida Liberdade - and turn left on the last crossroad. Walk 3 blocks up the street Rua Alexandre Herculano, on the left side of the third crossing you will find the yellow building of our guesthouse. When ending up with the yellow metro line in the Rato Metro Station, then take the “Rua do Salitre” exit. Walk couple of minutes down the street Rua Alexandre Herculano, until you arrive to the second crossing. Our guesthouse is in the half-yellow building, on top of the supermarket. The entrance is on the street Rua Rodrigo da Fonseca.